PLAYA VISTA, Calif.--(BUSINESS WIRE)--As the issue of implicit takes center stage in U.S. public-policy discussions, virtual reality startup SPACES Inc. has created an implicit bias VR program that can be used by both scientific researchers, corporate trainers and law-enforcement organizations. “VR is enabling us to understand how implicit bias affects our views of the world and the way we work and interact with others,” said SPACES CEO Shiraz Akmal. Implicit bias refers to measurable, objective attitudes and stereotypes that everyone carries. In recent months, implicit bias has become a topic of growing interest – and concern – leading to discussion of national programs to directly address it. Initially developed to assist an academic research examination of implicit bias, the SPACES program “embodies” participants – bringing to life the age-old adage of “stepping into someone else’s skin” to develop greater sensitivity. 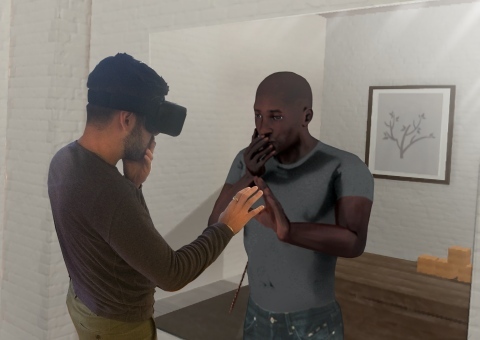 As applied in the research project, the SPACES program, which has been in development for several months, illuminates the potential of VR technology to reduce implicit bias. “The work we’ve done with researchers indicates that VR could possibly reduce the effects of implicit bias,” Akmal said. “The idea that VR can be used for much more than entertainment is one of our core philosophies, and is particularly important at a time when the issue of racial sensitivity is reaching a critical point in our society.” The academic research study powered by SPACES’ technology was one of the first projects that attracted the company’s attention when it was formed earlier this year, he added. The SPACES implicit bias VR program is designed to be used in both research environments and in training programs, ranging from law-enforcement to corporate training. Based in Playa Vista, Calif., SPACES Inc. is a privately held virtual reality startup that has raised more than $3 million in initial funding and has also entered a $30-million joint venture with China-based Songcheng Performance Development Company Ltd. SPACES is led by CEO Akmal and chief technology officer Brad Herman. Virtual reality startup SPACES today introduced a new VR program that has the potential to reduce the effects of "implicit bias," a concept that has been gaining the attention of U.S. policymakers.